In 1982 while visiting Hong Kong I heard Strobe Talbot, foreign policy analyst for Yale university and President of the Brookings Institute, speak about his experiences as a P.O.W. during the Viet Nam war. 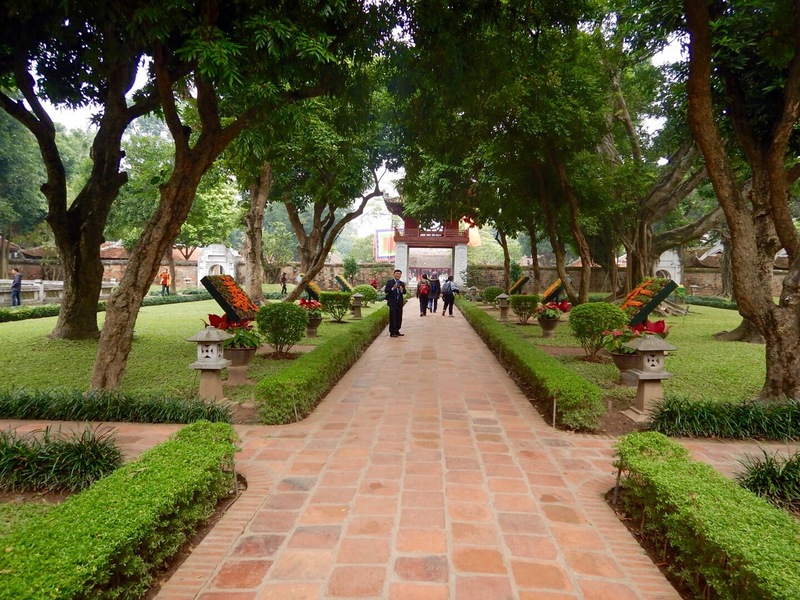 He was interred in the Hoa Lo prison in Ha Noi, known more affectionately by its ‘guests’ as the Hanoi Hilton. I recall quite vividly the story of his years of interrogation and solitary confinement, and of how inmates used the tap code to share desperately needed communication. Ho Loa was demolished in 1990 destroying any inclination I might have had to morbidly drift through deserted cells. Instead I was lured by the enchantingly named and much more upbeat Temple of Literature. 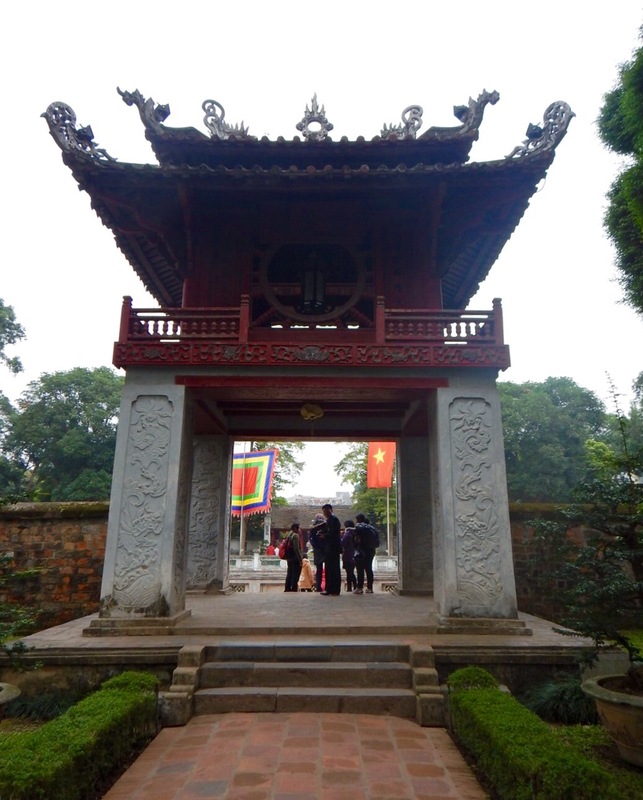 The beautiful temple and lovely gardens were built in 1070 as Viet Nam’s first university and it is still revered today as a symbol of scholarship. 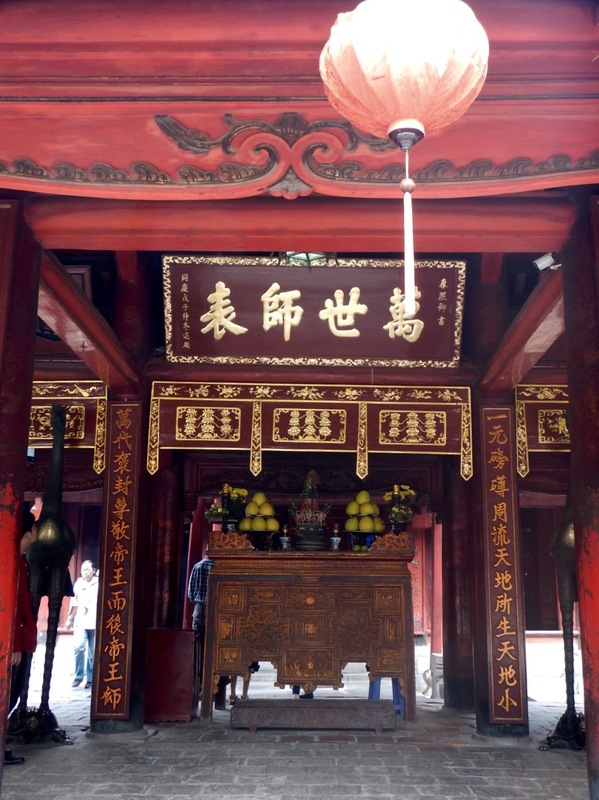 It’s also a tribute to Confucius and his teachings, hence the significant Chinese influence. The Great Portico. The huge bronze bell is rung on ‘auspicious occasions.’. The Constellation of Literature Pavillion. The ‘Well of Heavenly Clarity’. I can only think that this was designed to provide tranquil meditation for the students who attended the university. 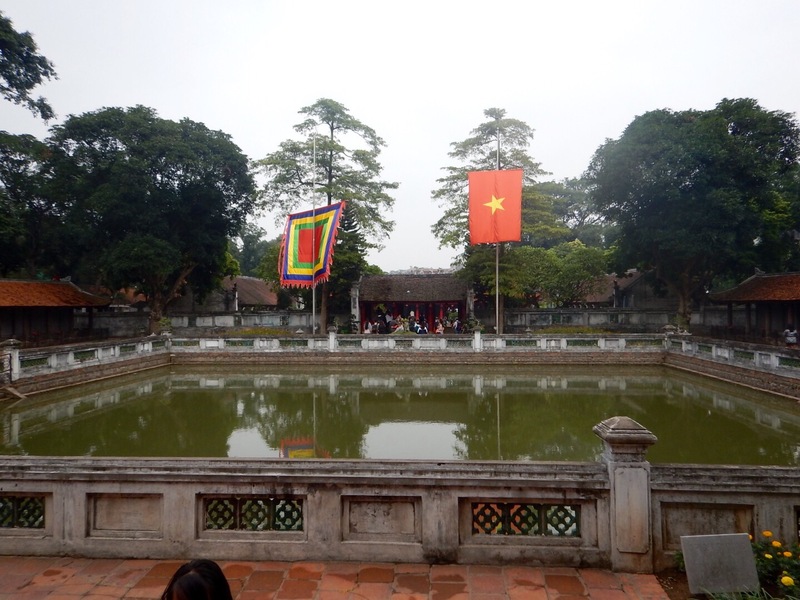 The real treasures of the Temple of Literature are in the long buildings on either side of the well. These buildings contain the precious Stelae of the Doctors. 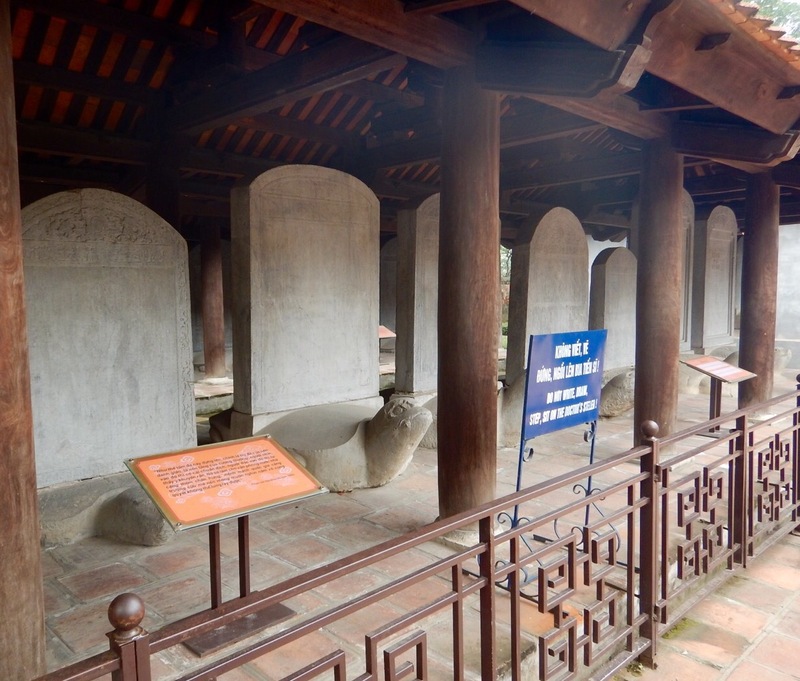 The stelae honor the achievements of early graduates of the university and were constructed in the 1400’s. They contain the names and birth dates of early scholars. 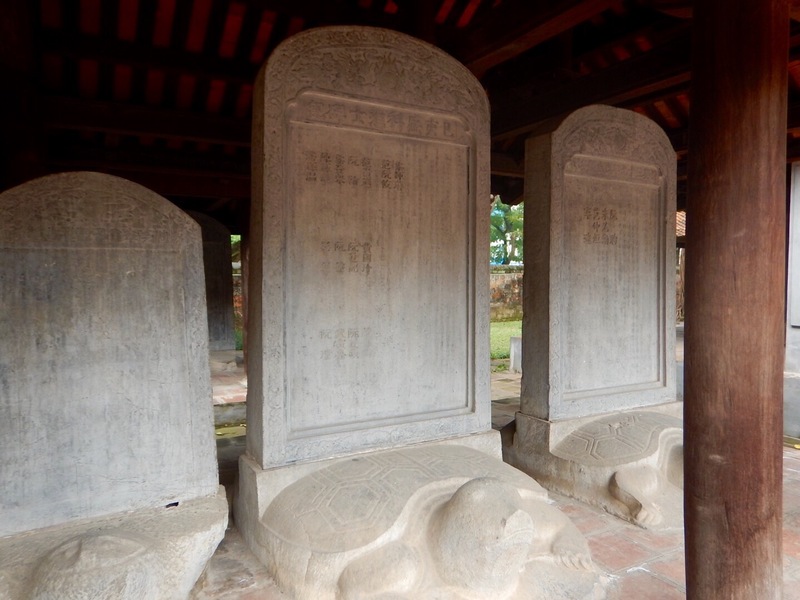 The stelae are carved of blue stone and mounted on the backs of turtles. 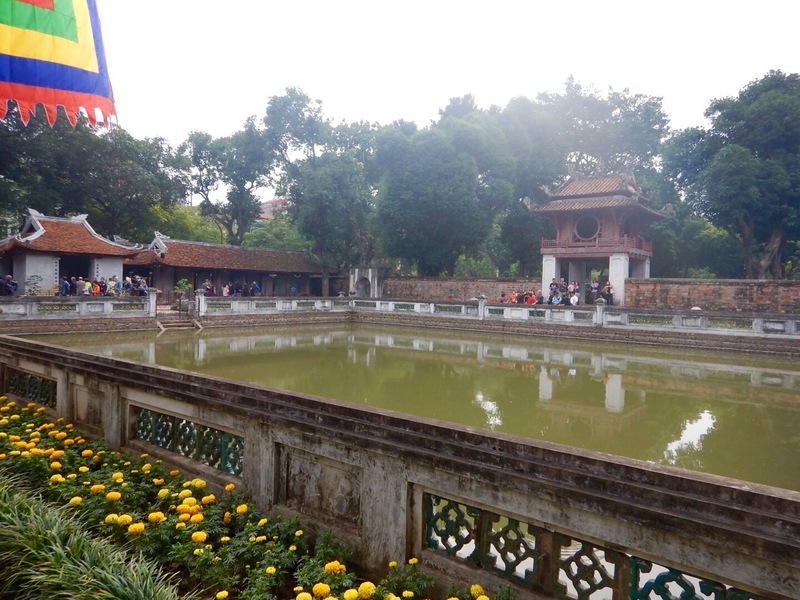 Turtles are one of four animls sacred to Viet Nam that include the unicorn, phoenix and dragon. Seems very Harry Potter-esque to me. Is there really such a thing as a phoenix or a unicorn? A dragon? Hmmm. And there you have it…a phoenix standing on the back of a turtle. 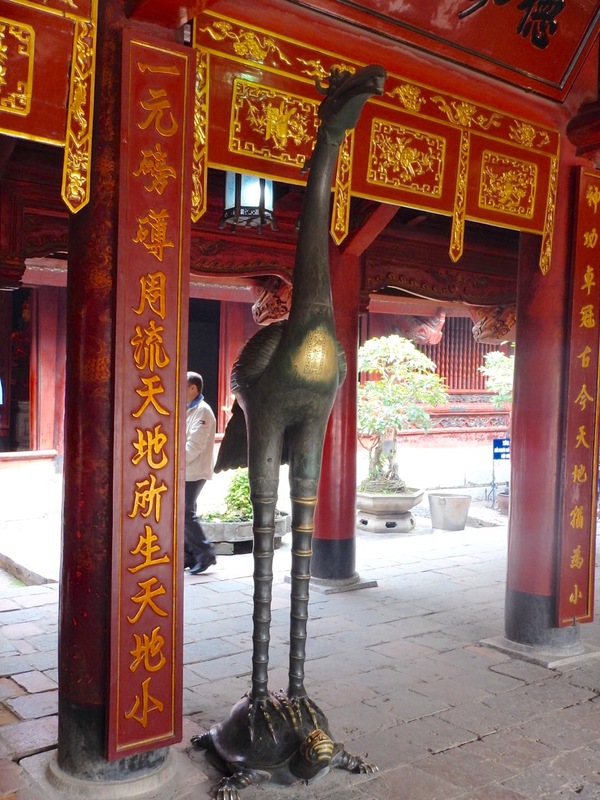 This gorgeous bronze stands guard at the altar to the rector of the school and to Confucius and his disciples. Traditional dress for Viet Namese women is the ao dai – pronounced ‘ow yi’. I saw it most often worn by young women having their wedding videos taken. Wedding videos and photos are big business throughout the country. They are usually done weeks ahead of the wedding and typically involve many wardrobe changes and highly choreographed ‘candid’ scenes of the happy couple strolling through a park or along a lake. 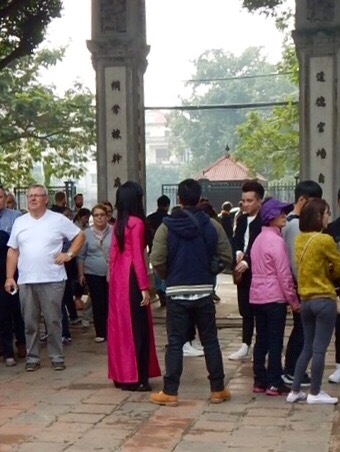 Occasionally I saw the ao dai worn as street wear – delightful and graceful. 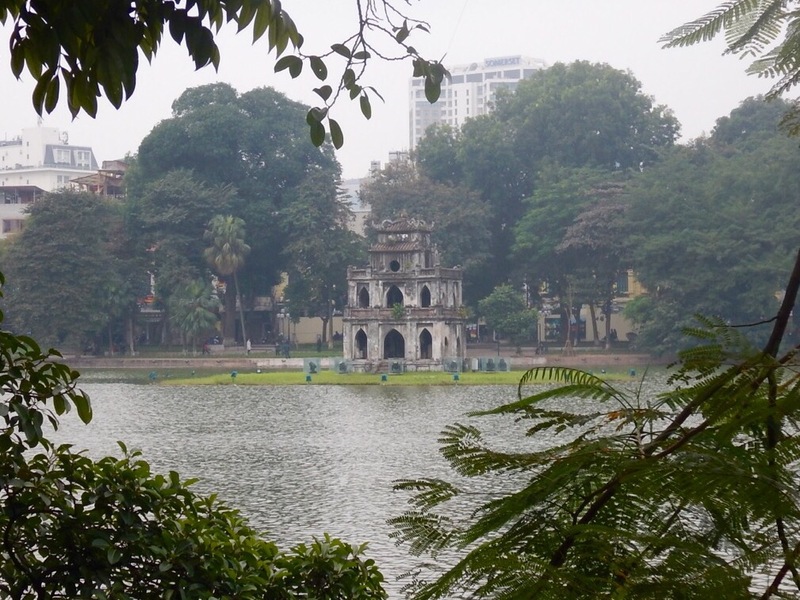 Hoan Kiem Lake lies in the center of Ha Noi. The name means ‘restored sword’, annointed by an ancient Emporer who, while boating on the lake had his magic sword magically returned to him by a magic Golden Turtle god. Many, many lanes of traffic swirl around the lake at all hours, intersected occasionally by huge traffic circles that allow more jammed lanes of traffic to join in the slow dance. The Turtle Tower sits slightly a tilt on a tiny islet in the middle of the lake. 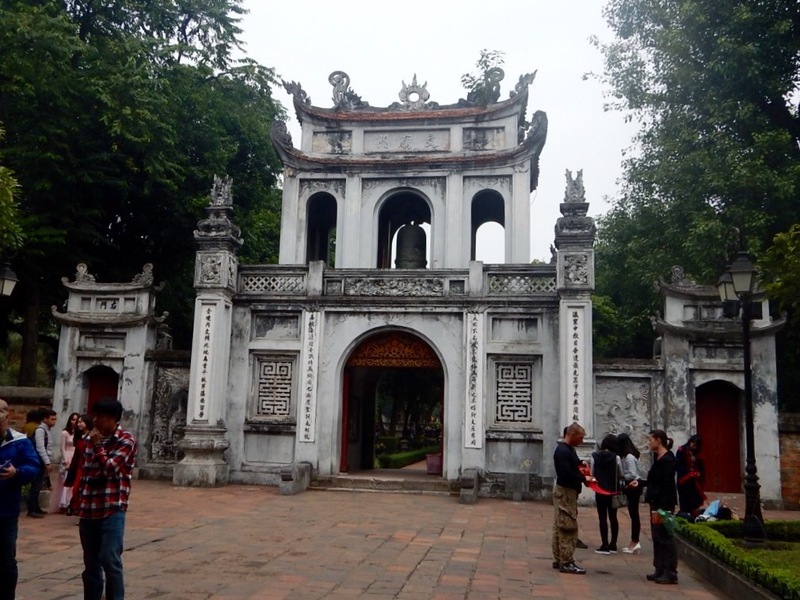 Like so many places in Ha Noi it was named for an old and intricate legend. You can read one version of it here. The most famous bridge on the lake is the Huc Bridge. 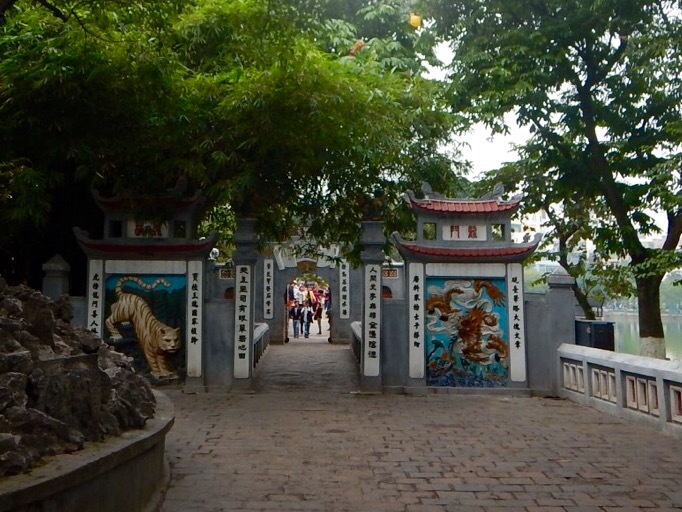 This is the other bridge across the lake from the Old Quarter to more modern Ha Noi. The lake is bordered by beautiful gardens and walkways. 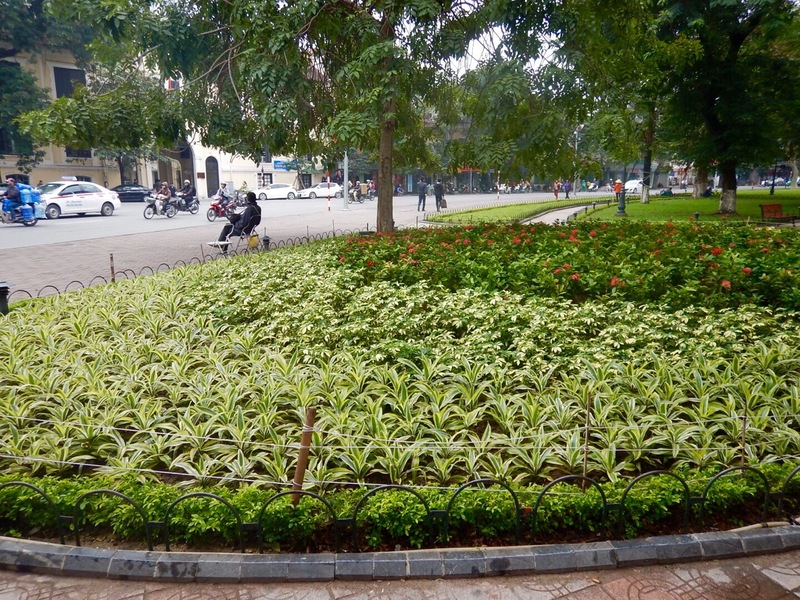 These green, shaded spaces are plentiful throughout Viet Nam. They not only make perfect backdrops for the all-important wedding video but, more importantly they provide much needed shade during the summer months when temperatures typically reach the mid-thirties with high humidity. 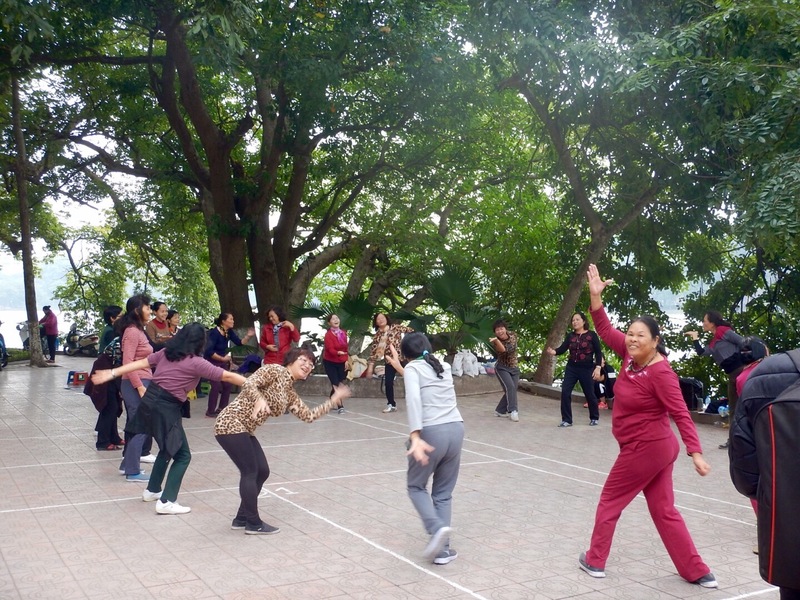 If you take an early morning walk through the parks anywhere in Viet Nam you will see people moving in the cool of the shade. Aerobics is popular but also salsa dancing, badminton and martial arts of any kind. ← Good morning, Viet Nam!